Artesia Public Schools Superintendent Crit Caton and his administration, along with the Chamber of Commerce and several community sponsors, welcomed 20 new teachers to the APS system this morning at the annual New Teacher Breakfast at the First Baptist Church Total Life Center. 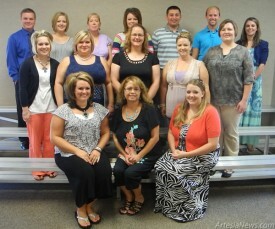 The community sponsors were supportive and generous, providing gifts of appreciation for the new educators. The Artesia High School cheerleaders also donated Bulldog t-shirts. Pictured above are, back row from left, John Faulkner, band director at Artesia (Park) Junior High; Kaci Whitmire, fifth-grade teacher at Yucca Elementary; Bonnie Torrez, fourth-grade teacher at Central Elementary; Rachel Casey, fifth-grade teacher at Yucca; Jourdan Rodriguez, science teacher at Park; Daniel Kidd, PE teacher at Yucca; Ashley Grantham, fifth-grade teacher at Hermosa Elementary; center row from left, Kaylee Peterson, third-grade teacher at Yucca; Ashley Romine, science teacher at Park; Ruth Faulkner, band director at Zia Intermediate; Anna Lovato, inclusion science teacher at Park; Audra Mason Kimple, fourth-grade teacher at Hermosa; front row from left, Kirsten Caton, English teacher at Park; Dina Williams, teacher at Grand Heights Early Childhood Center; and Jennifer Willhelm, English teacher at Artesia High School. 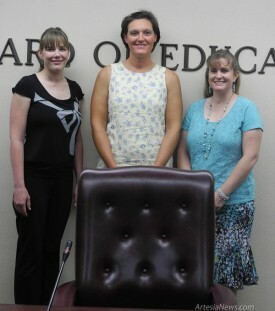 Pictured at right are Da’Niel Beauchamp, math teacher at Park; Jennifer Urban, math teacher at Park; and Melissa Plotner, speech teacher at Hermosa. Not pictured are Zabrina Bowden, inclusion history teacher at AHS; Yvonne Branch, senior counselor at AHS; Scotty Stall, principal at AHS; Eric Greer, assistant principal at AHS; Mike Worley, principal at Hermosa; Kimberly Combs, teacher at Roselawn; Kelli Fraze, teacher at Yeso Elementary; Brandi Bowman, science teacher at Zia; Jerry Burleson, math teacher at Zia; Tiffany Paschal, digital media teacher at AHS; Eugene Irby, drama teacher at AHS; and Scott Neel, social studies teacher at Zia. Also recognized for 25 years of service were Sherrie Bratcher, Rosa C de Baca and Larry Combs.